“Be sure of this: if the master of the house had known the hour when the thief was coming, he would not have let his house be broken into. Peter asked Jesus if this was directed at the apostles, or was that message meant for the entire crowd? The message Jesus gave to Peter was (essentially), don’t be a slacker! You have to be prepared, because you don’t know the day when we will be called. I’ve heard it said the true test of a man’s character is what he does when no one is watching. I think this is very true. So who are you when nobody is watching? I like to keep this thought in my mind throughout my day as a reminder, but I digress. I think that message of character applies here as well. Jesus is telling us, through parables, that we can’t just “act the part” at the end. It’s not enough to stand up straight and look ready when the master appears — that will be too late. You need to be ready and doing what is right ALL the time. The parable ends with a mightier message: “Much will be required of the person entrusted with much, and still more will be demanded of the person entrusted with more.” We interpret that to mean, God expects ALL of us to lead good lives and follow his commandments. But even more will be demanded of the leaders. Who is a leader? In the church, we have the priests, bishops, deacons, as well as other members of the church leadership. And on a higher level of the church here on earth, we have the cardinals and the pope. But even on the lowest level, Jesus is referring to anyone who might be (or could be) a role model: parents, teachers, leaders in the community. Keep in mind, we go to church to give praise to God and participate in the Eucharist. But when mass is over, WE become the church. It is our mission to carry. Who are you when nobody is watching? I think we should all strive to be as hardworking and faithful as possible at all times. That would be a good start. You need to be ready and doing what is right ALL the time, not just when it’s convenient or when it’s comfortable to. It’s important to remember we can’t just be slackers, and show up on the last day expecting a ticket to the show. We have to earn our way in. Defining Vigilance: What Does It Mean to You? Have you ever stayed up into the night to care for someone in your family who was ill? Or, if you are a parent, have you stayed up late, waiting for a child to arrive home safely? Vigilance is defined as the action or state of keeping careful watch for possible danger or difficulties. Defining vigilance personally can lead us to different meanings of the word. What’s that over-riding feeling you have at those moments? When your parent’s fever spikes to 101, or your baby won’t stop coughing? I just want my loved one to be safe, I don’t want them to be harmed in any way. I know, personally, as a parent, I’ve actually stood by the window waiting to see that pair of headlights to come down our street, late at night. You just want your children to get home safely, even if it is a half-hour beyond the time you wanted them home from a party. It’s a nervous emotion, this feeling of vigilance. You need to be prepared. Jesus then goes on to add that the master will then wait on THEM, those who are vigilant. Indeed, even if the Master arrives in the second or third watch (meaning, later in the night), those who are vigilant, ready and prepared, will be rewarded. What is the meaning behind the message? Is it to prepare for the end of the world? No. My understanding is first, there is no timetable for His return (it could be in the second or third watch — later than you want!). Regardless, you must remain prepared every day to ward off temptation. You must be ready and prepared to avoid the evil that exists in the world, to continue to persevere in your belief in God and the Holy Family. When personally defining vigilance, that is my definition. How would you define vigilance, in your words? Saint Augustine said the devil attacks us through fear and greed. Saint Augustine said the devil attacks us through greed and fear. When we don’t have possessions we pursue them (with greed). Yet, when we have accumulated possessions, we choke on the fear of losing them. Throughout our lives, we often form these mental impressions that the devil is “personified” taking the form of a person. But yet the devil’s work can be found when we exercise feelings like greed. But fear as well can be an overwhelming feeling, and can be the work of the devil. As human beings, we become weak and open to the worries that come along with fear. Those fear-driven decisions can often wind up being disasters. Isn’t worrying about what others may say, or what others may think always driven by fear? Why do we worry about things we cannot control? We’ve all heard greed is the root of evil — because greed blocks our view (our path) to charity. On the flip side, charity is the root of all that is good. 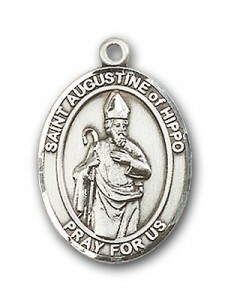 Greed really IS a silly vice, and Saint Augustine was correct the devil attacks us through greed and fear. When the time comes, as your life here on earth slips away, to what good was accumulating, hoarding, not sharing all these earthly possessions? All you have, before you approach the next phase of your life, is yourself, your decisions, your soul. No possessions.